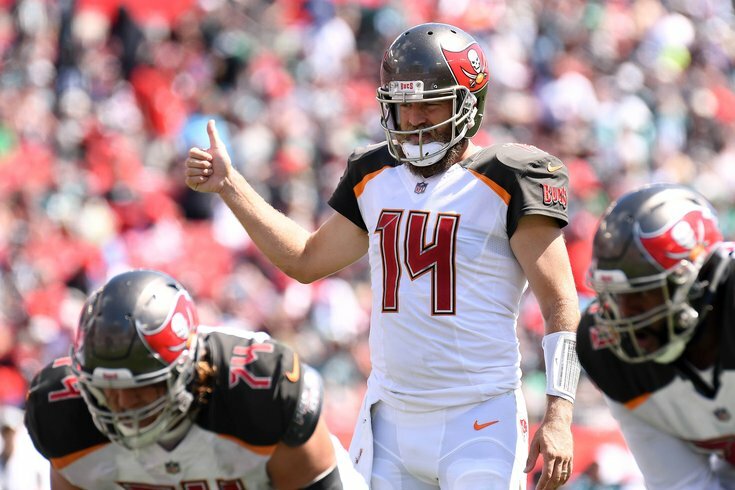 Will there be some Fitz-magic for the Bucs this weekend? Each Friday for PhillyVoice, Steve Maltepes, known as “The Philly Godfather,” will impart his gambling wisdom on the Eagles and where the smart money is going on various pro and college football games this weekend. Maltepes is one of the nation’s hottest sports betting experts who appears weekly on national radio and has his own website, thephillygodfather.com. What is the line telling you: The oddsmakers and offshore books opened this line with the Panthers being a large seven-point favorite at home, with a combined total set at 55. Early in the week, we saw a lot of sharp money on Tampa at that key number of 7, which forced the books to lower the price to 6.5 and 6. There are still some 7s out there, but the total hasn’t moved in the market. Early market reports and offshore are showing a top-heavy ticket count on Cam Newton and the Panthers, getting 60-percent of the love from the average sports bettor. The sharp money is going to be all over Tampa in this one, because Carolina’s defense ranks 13th in yards per game (351 yards/per game), and 19th in yards per play (5.7 yards) when looking at key metrics. Carolina is playing a divisional foe in Tampa, which has an offense ranked third in yards per play (6.8) and second in yards per attempt (9.4). The Panthers played one of the better defenses last week in Baltimore, and we expect them to be a little banged up. We think “Fitz-magic” is back this week. Don’t be surprised if you see an upset here. Bottom line: The smart money likes the Bucs plus-6. What is the line telling you: The oddsmakers and offshore sports book opened with the Broncos being a 1-point favorite with the combined total of 46. Since then, there has been no movement on a side or a total. The early Vegas reports were showing that 70-percent of all tickets punched have been on the Texans. The recreational sports bettors are backing this red-hot Houston team that’s won five in a row and won their last two games by an average of 16 points. The sharp money is going to be on the Broncos here come kickoff. The reality is Houston hasn’t beaten a team with a winning record all year, while the Broncos have beaten the 4-3 Seahawks and lost two close games to the Rams and Chiefs, who are arguably the two best teams in the NFL. We like Denver here at home. We expect the Texans to get tired late in the fourth quarter in the mile-high air. Bottom line: The smart money likes the Broncos minus-1. What is the line telling you: Here, we have two teams that are trying to stay relevant. The 3-4 Titans travel to AT&T Stadium to face the 3-4 Cowboys. This line opened up with Dallas being a 6.5-point home favorite, with a combined total of 40. Since then, we’ve seen some sharp money begin to shake this line and force oddsmakers to adjust their price on a side, while there’s been no movement on the total. The early market reports are showing a 50-50 split on all tickets punched, but the majority of the big action is on the Titans, since they’ve received 80-percent of all the money wagered at this point. The sharp money with these soft betting limits is a market manipulation. At first, the Cowboys laying 6 here seemed like a large, significant number. The Titans have quality wins over the Eagles, Texans and Jaguars, so taking 5.5 points on a road dog is really enticing for the recreational sports bettor. Tennessee also gave a valiant effort in the 1-point loss to the Los Angeles Chargers, in a game in which Melvin Gordon didn’t play. The Cowboys are just a better team on both sides of the ball. On offense, the Cowboys rank three spots higher in overall efficiency and 16 spots higher in rushing efficiency. On defense, the Cowboys rank higher and if they establish their run game early, the Titans’ rush defense will start huffing and puffing in the fourth quarter. This line may keep dropping. Bottom line: The smart money likes the Cowboys at minus-5.5. The Philly Godfather can be followed on twitter @Phillygodfather & his website is www.thephillygodfather.com.